On the conference, the participants raised and discussed a number of priority issues related to the anti-environmental crimes in the country for exchange of views and optimal solution options. For instance, they highlighted issues such as prompt actions for cost estimations once investigations and damage estimates are time-consuming and costly in environmental crimes. WWF-Mongolia initiated a research conference “Current State, Priority Concerns, and Solutions of Anti-Environmental Crimes in Mongolia” at the Law Enforcement University. The conference was supported by the Ministry of Environment and Tourism, the General Prosecutor’s Office and the General Police Office. Its purpose was to encourage the university students and researchers to actively take part and debate, and to publicly disseminate the newest ideas and approaches. Prior to this research conference, the organizer received over 30 presentations from respective researchers and eight out of them were selected and presented on the conference for its audience. On the conference, the participants raised and discussed a number of priority issues related to the anti-environmental crimes in the country for exchange of views and optimal solution options. 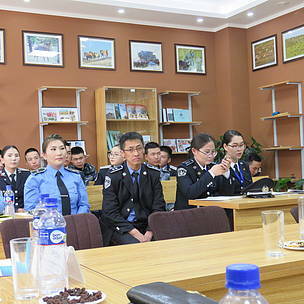 For instance, they highlighted issues such as prompt actions for cost estimations once investigations and damage estimates are time-consuming and costly in environmental crimes; effective cooperation and coordination among the respective public administrative organizations; creating threatened and endangered wildlife (flora and fauna) DHK funds at the national court (legal) expertise institute to use its opinions for adjudication; and inclusion of additional anti-environmental crime related topics in the Law Enforcement University’s training curriculum, and so on. At the end of their discussion, the conference participants agreed on forwarding recommendations to the Ministry of Justice and Internal Affairs, the Ministry of Environment and Tourism, and the General Police Office for consideration. Prior to this research conference, the organizer received over 30 presentations from respective researchers and eight out of them were selected and presented on the conference for its audience.